The Nigerian Egusi soup, prepared with melon seeds, is native to the southern part of Nigeria – Igbos and Yorubas Egusi soup is also one of the most popular soups for all Nigerians and non-Nigerians that like Nigerian fufu recipes. It is known as Miyan Gushi in Hausa. Boil the shaki, stock fish and dry fish in 1 litre of water with the 3 Knorr cubes till they are well done. First sign of a done shaki is that the cuts will start curling on itself. Put 2 cooking spoons of red palm oil into a dry pot and set on the stove to heat. As soon as the oil is clearer, add the ground egusi and start frying. This should be done on low heat to avoid burning. Keep frying till you see the egusi getting drier. One sign of this is that it will start sticking to the bottom of the pot. Now, start adding the shaki/fish stock little by little while still stirring the egusi. When the stock is exhausted and you feel that the soup is still too thick, you can add more water. If your choice of vegetable is bitterleaf, it should be added now as well. Cover the pot and cook for 30 minutes. 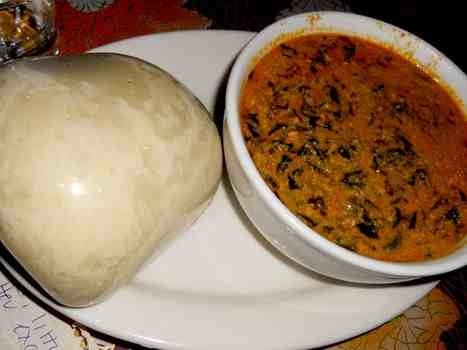 The egusi is done when you notice that the oil has risen to the surface of the mix and separated from the mix. If this is the case, add the fish, shaki and meat you boiled earlier. Also add pepper and salt to taste. If pumpkin leaves (or any other soft vegetable) is your choice, please add it now. Cover the pot and once it gets a good boil, it is done! 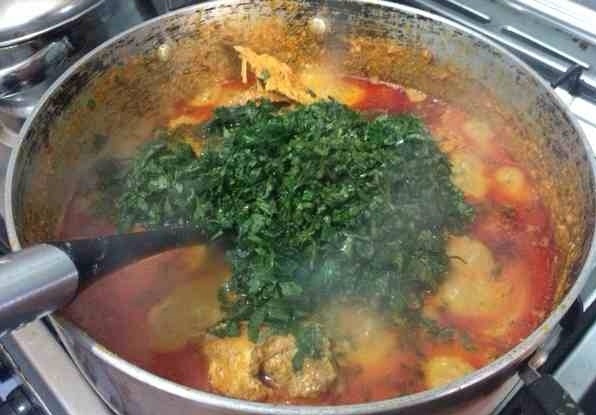 In this method, as soon as the shaki, fish and meat are done, remove them from the stock (water used in cooking the meat and fish) and place in a different pot or plate. Add the ground egusi to the stock and stir. If the stock from cooking your meat and fish is not enough to give you a medium consistency, add some water to the same level as the egusi. Add 2 cooking spoons of red palm oil and bitter leaves (if it is your choice of vegetable), pepper and salt to taste and cook for about 7 minutes. Add the the meat and fish. If using pumpkin leaves or any other soft vegetable, add it at this time, stir the soup and leave to simmer for 2 minutes maximum. Turn off the heat. Leave to stand for 2 minutes before serving. 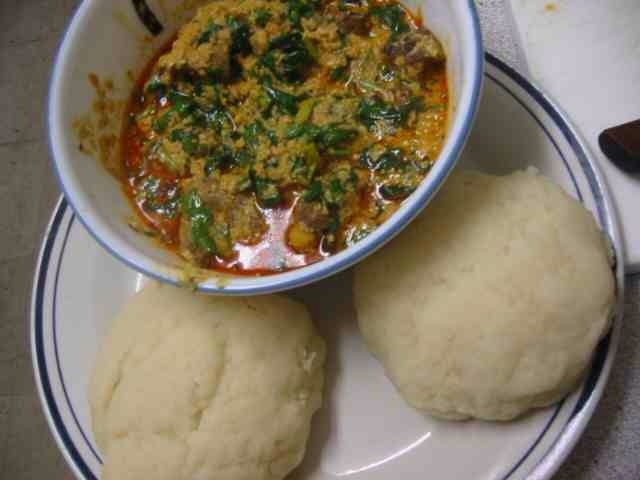 The egusi soup is ready to be served with Eba (Garri), Agidi, Amala, Semolina, Tuwo Shinkafa, Pounded Yam.